If you follow me on Twitter, you may know that I am slightly obsessed with all things pumpkin right now. It’s a seasonal addiction of sorts that hits me mid October and lasts until around Christmas. I don’t know where the pumpkin addiction came from, in fact as a kid I hated the stuff. I remember taking a slice of my Nana’s pumpkin pie during the holidays simply to appease her. I would smother it in Cool Whip, eat all the whipped topping off, then nonchalantly make my way to the kitchen can to chuck the piece of pie into the trash when no one was looking. Now as an adult, there is something about the aroma of pumpkin baked goods wafting through my home that makes me all warm and fuzzy inside. You should definitely brace yourselves for a serious pumpkin extravaganza on My Baking Addiction. No worries if you are a pumpkin hater, I will also be showcasing many other desserts that do not include pumpkin! My blog will be chock full of apples, caramel, chocolate and spice, so please check back often! 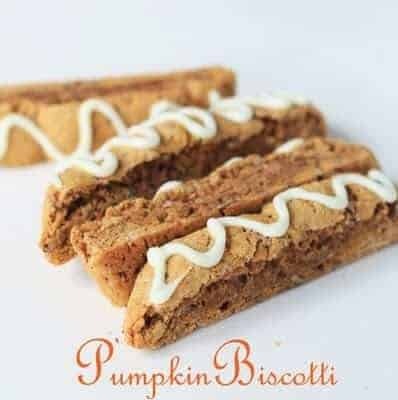 I bookmarked this recipe for Pumpkin Pie Biscotti about a month ago in preparation for my pumpkin fever. 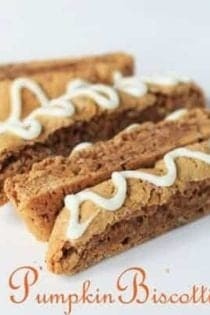 This biscotti comes together very easily and has great pumpkin pie flavor. My only issue is that they were not as crunchy as I would like them to be. The outsides definitely had a high level of crunch, but the middle was slightly chewy, not a bad chewy, just, well a little chewy. I may try making these again, but subbing out some of the brown sugar for white and maybe baking a tad longer. All in all this was a tasty recipe, just not the texture I was trying to achieve. Thanks so much for stopping by, stay warm, stay healthy and stay happy! 3. Melt butter in a large skillet over medium heat; add nuts. Cook, stirring constantly, until nuts are browned. Remove from heat and cool completely. 4. Knead or gently stir cooled nuts into dough. Place dough on a lightly floured surface and divide into 2 portions. Lightly flour hands and shape each portion into a 2 x 10″ long log. Place logs 3″ apart on lightly greased cookie sheet. Bake for 24 minutes; cool logs 15 minutes. Reduce oven temperature to 300 F.
5. After some cooling, move a loaf to a cutting board and cut diagonally into 1/2″ thick pieces. Do the same to the other loaf. The interior of each biscotto should still be just a little moist (while the exterior is nice and hard). The crust of the loaf will probably be quite hard, so use a large serrated knife such as a bread knife for this job. 6. Place the biscotti with a cut side facing up on a half sheet pan and bake for 8 minutes. Remove the pan and flip all the biscotti over so the other cut side is now facing up. Bake for another 7 minutes. Set all the pieces on a wire rack to cool making sure that none of the biscotti are touching each other. If the biscotti are placed too close together, they could get a little soft or soggy as they cool. 7. Once the biscotti have fully cooled, they can be consumed as is, or white chocolate dipped. I opted for a simple white chocolate drizzle. I just melted some white chocolate chips, placed the melted chocolate in a zip top bag, cut a small opening in one corner and drizzled it across the biscotti. - The biscotti tastes best during the first few days, but will keep for up to a month in a sealed air-tight container.